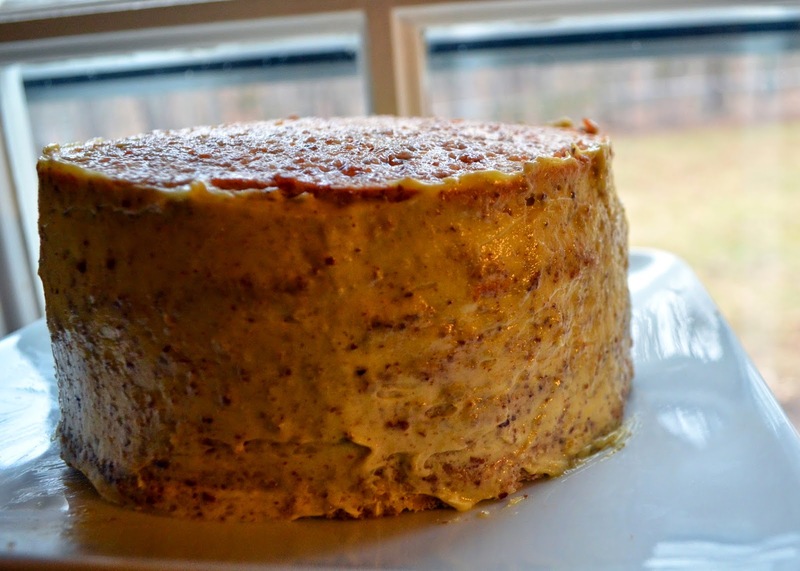 This recipe traditionally uses toasted hazelnuts but the hazelnuts are often substituted with almonds (in parts of Austria) or walnuts (mainly in Hungary).The cake has 5 dacquoise layers, using hazelnuts, walnuts or almonds. The Esterhazy web, or more-widely known as the spider web decoration is always on the top of this cake. For the month of January Jelena from A Kingdom for a Cake invited us to start this year with a dreamy celebration cake. She challenged us to make the Esterhazy cake a.k.a the Hungarian dream. What better way to start the year than with a sweet dream? She says that in the 19th century, a confectioner from Budapest baked and named the Esterhazy Torte after the wealthy Prince Paul III Anton Esterhazy de Galantha, a member of the Esterhazy dynasty and diplomat of the Austrian Empire. 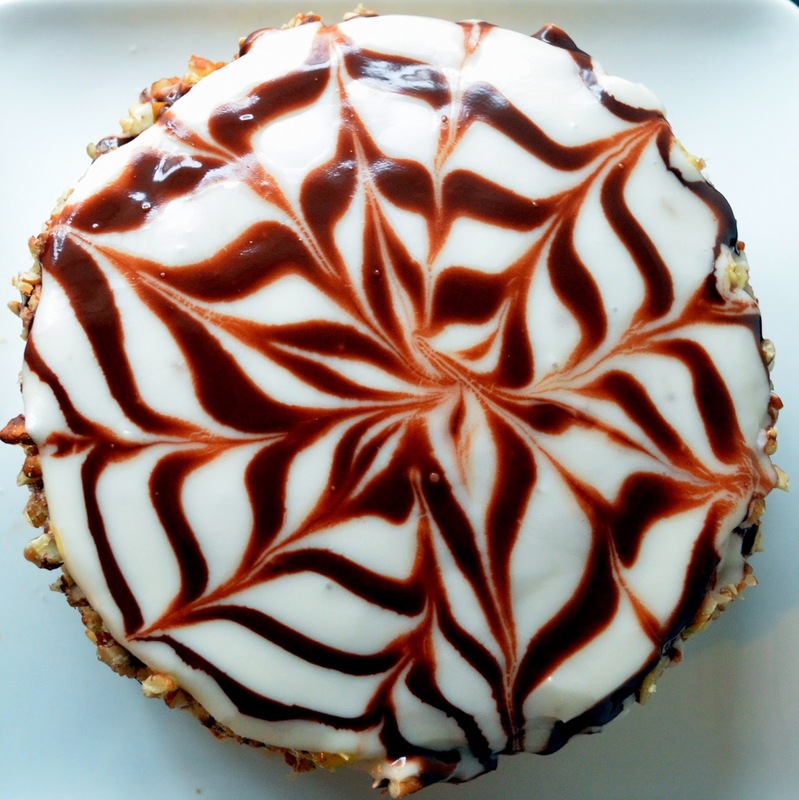 If you would like to know more about the Daring Bakers you can visit their website. This recipe is long and does take some time but it's not hard to do. It's recommended that the cake is prepared over two days. Place the hazelnuts on an oven tray in a cold oven, increase the temperature to moderate 180°C/350°F/gas mark 4, and bake until a nice aroma starts to come out of the oven and the nuts have become darker. Continue until their skins almost turn black or dark brown and the hazelnut 'meat' becomes a caramel colour. You will need to watch the oven carefully since the nuts can easily burn. From time to time, just open the oven and carefully try one to see if the centre is nice and crispy, but be careful not to burn yourself. It should take about 15-25 minutes. Set aside ¾ cup (3½ oz) (100 gm) toasted nuts and roughly chop them. These will go around the cake at the end. The rest need to be ground. 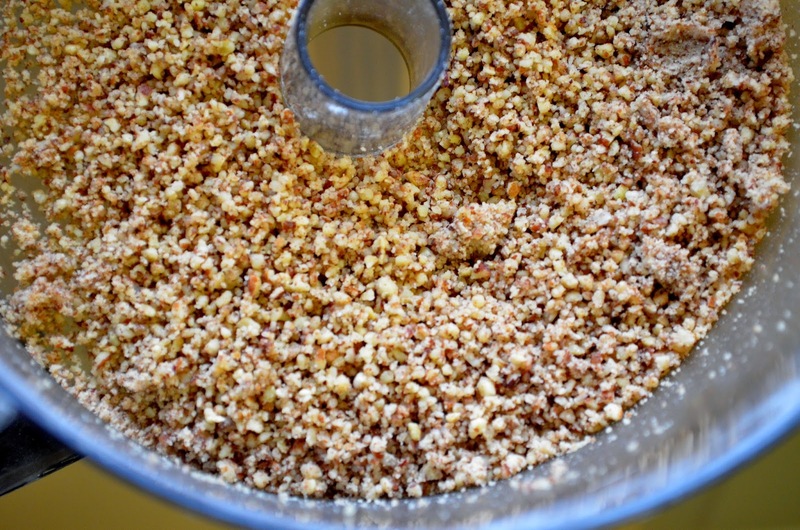 A grinding machine is best since a food processor might turn the hazelnuts into a creamy mush. If you are using a processor do it in short pulses so they do not have the consistency of peanut butter but of fine powder. Divide the ground hazelnuts into 2 batches of 2½ cups (9 oz) (250 gm) and 1½ cups (5-1/3 oz) (150 gm) for the sponge layers and the filling respectively. Turn the mixer to the lowest speed and add in the hazelnuts mixed with the flour and beat until just combined. Cut baking paper into five squares large enough to draw a circle of 10 inch (25cm) in diameter on the squares. Place the tray into an preheated moderate 325°F/160°C/gas mark 3 (no fan) oven and bake for 14 minutes. It will look soft but that is how we want them. Your finger should not stick to the layer when you touch it. If you have a 10 inch (25cm) diameter spring form pan with a removable bottom just cut out five pieces of baking paper to fit the bottom and spoon the mixture in the pan. Make sure to cool the bottom of the pan after removing each layer and before placing the egg white mixture for the next layer into it. Place all the layers next to each other. Beat the cooked yolks for 30 seconds with an electric mixer. Beat the room temperature butter for 2 minutes until light and fluffy then beat into the cooked yolks. Add in the ground hazelnuts and beat again until combined. Place some baking paper over the torte. Press a bit with your hands to even it out, put another tray over the torte and now place something heavy on the top to allow the torte to level up. A pan half-filled with water will be fine. Place the whole torte with the pot in the fridge for one hour. 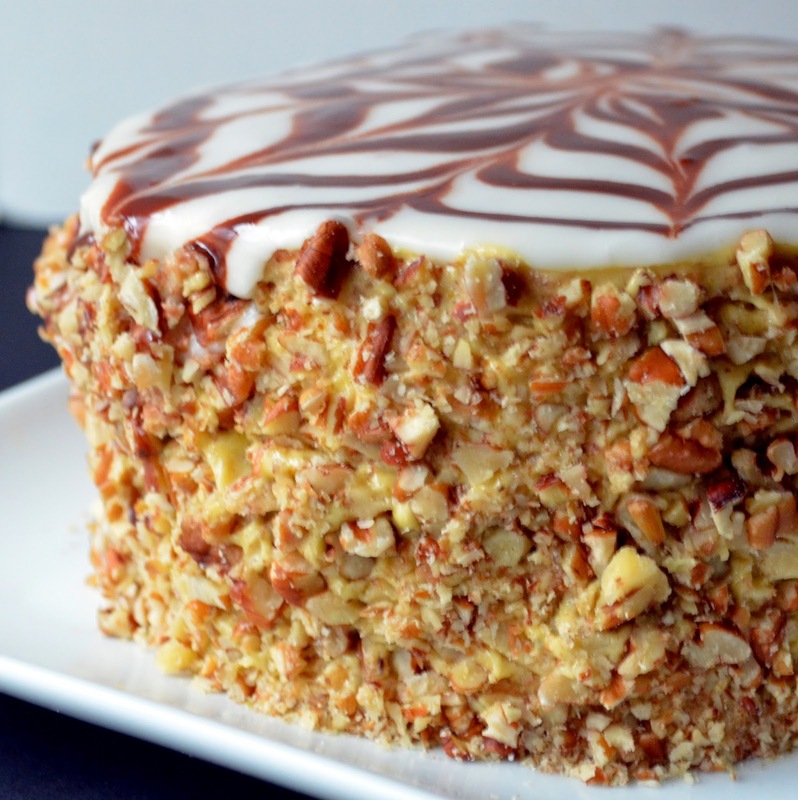 When the 30 minutes is up, spread the 2 tablespoons of reserved hazelnut filling around the cake. By hand mix the powdered (icing) (confectioners') sugar, oil, lemon juice while adding teaspoon by teaspoon of hot water until the mixture is creamy, but not runny. Mix vigorously for a couple of minutes. The sugar should be lemony. You will need around 2½ to 3¼ cups of powdered sugar but it is better to have more than less, since when you start spreading you cannot go back. You will have some left over icing. If it is a bit uneven just turn on the hair dryer and heat the icing so it will smooth out a bit. Melt the chocolate with a teaspoon of oil, place in a piping bag, or a plastic bag with a cut in the corner that will act as the tip. Press the remaining crushed hazelnuts around the cake to complete the decoration. Let rest in the fridge for at least 24 hours before tasting. This cake that gets better as times goes by. We usually enjoy ours for 7 days.